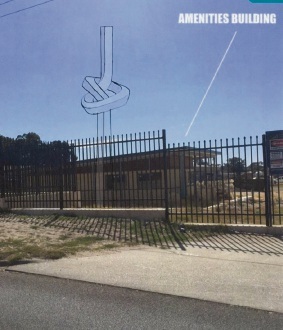 A 3.2 TONNE, $60,000 ‘concrete knot’ public art piece will be a feature of Bayswater’s contentious concrete batching plant after councillors approved a proposal on Tuesday. Despite the City not supporting the batching plant, it was decided that the 5.3m concrete knot satisfied its public art policy requirements. Provision of public artwork was one of the conditions of the State Administrative Tribunal’s (SAT) conditional approval of the plant in 2016. Artists Alex and Nic Mickle of Safehaven Studios said the piece on Collier Road would “challenge perceptions” in the concept statement. 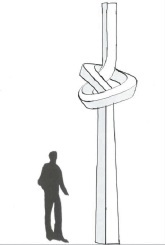 “A concrete knot challenges our perception. It suggests a fluid form when concrete as its name suggests is rigid and solid,” the artists said. “Concrete is an amazingly versatile material, we have designed an artwork that expresses this idea in a bold but simple way. Concerns were initially raised because the artwork was planned behind a fence but council moved a recommendation to place the fence around the artwork to ensure it was more accessible to the public. Councillor Sally Palmer said by moving the piece into the public realm the public would at least be able to view and interact with the piece. While he supported its approval, Cr Chris Cornish said there was a danger on councillors giving their opinion on the artwork because it was subjective. “We’re never going to have everyone say it is fantastic… we’re never going to agree,” he said. The cost of the work, including ongoing maintenance, will fall on the batching plant applicant WA Premix.